Cynthia Turner Camp is Associate Professor of English and Graduate Coordinator at the University of Georgia in Athens, GA, where she teaches Middle English and manuscript studies. She and her students blog about their adventures with manuscripts on the Hargrett Hours Project website, and you can also follow along on Twitter at @hargretthours. 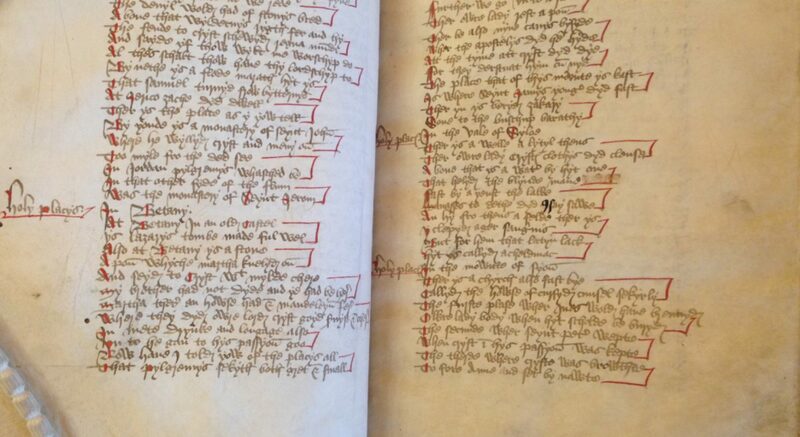 It can be a challenge to teach a course on medieval manuscripts at a state university in the United States. Many of us have limited (at best!) manuscript holdings, so we cannot show our students a wide variety of scribal hands, page designs, or illumination styles. Yes, digital facsimiles can fill some holes, but they cannot replace the experience of working with original materials. So when I redesigned my undergraduate course on manuscript studies a few years ago, I decided not to make broad coverage a course goal. Instead, I took a “do more with less” approach, designing courses that capitalize on available resources. In these classes, students dive intensely into one small slice of manuscript studies via one of the five codices or 20-odd fragments that UGA owns. In one series of courses, for example, the students are studying a never-before-examined Book of Hours, the Hargrett Hours, held by UGA’s Hargrett Library, learning how to transcribe, date, place, and analyze the contents of a Book of Hours. A second series of courses centers on helping the Special Collections librarians accurately describe their manuscript fragments. MS 2934 Book of Hours leaf (r). Photo by Cynthia Turner Camp. Although our manuscript selection is not large, the UGA has other intriguing tools: materials analysis equipment designated to be brought into non-STEM classrooms. UGA’s Center for Applied Isotope Studies, the oldest such center in the US, has a suite of portable instruments and a specialist, Dr. Alice Hunt, who will help humanities faculty incorporate this analytic approach into their courses. Although I have no science background, I realized this was an unprecedented opportunity for my undergraduate students to engage in truly cross-disciplinary research within the classroom. Manuscript studies has always been an interdisciplinary field, and that has only grown as book history scholars have turned increasingly to scientific analysis to better understand the physical materials used to create these artifacts. Examples of this pairing at its most elaborate include the MINIARE research project at the University of Cambridge, which has produced the invaluable online resource Illuminated: Manuscripts in the Making, or the Bodleian Library’s analysis of their twelfth-century Gospel of Luke. Such scientific analysis can provide focused insight into how individual books were produced and sometimes how they were used, confirming or qualifying the general claims that book historians have forwarded about manuscript production. CAIS’s resources would allow me to give my students a small taste of this marriage of the sciences and humanities. So, with Dr. Hunt’s help, I designed a unit in my Fall 2017 manuscript fragment class to pilot teaching the elemental analysis of medieval pigments to humanities majors. The objectives for this unit were modest: to identify the inks and pigments used on some of the single leaves in our collection. Dr. Hunt determined that the best device to achieve this goal was a portable X-Ray Fluorescence spectrometer, a device that uses high-energy x-rays to identify the elements present in a sample. Although it can’t see elements with a low atomic number (so organic pigments are invisible to it), it excels at identifying the transition metals commonly used in inorganic pigments (like lead, mercury, and copper). Knowing the chemical formulae of different pigments, we could match those elements to the elements present in our samples. A second but equally important goal was for my students to write about their process of discovery and conclusions for different audiences, including some of the class blog posts to which I am linking. This seemingly straightforward task took much preparation, especially because none of my humanities majors had more than high school chemistry experience. Students needed to learn in detail how different colors were manufactured: which pigments were organic and which inorganic, where their raw materials originated, what range of colors they might produce, and what their chemical makeup was. They needed to re-learn the periodic table. They needed to understand how the pXRF device worked – its functionality, its limitations – and how to interpret its graphical read-out (called a spectra). Working in teams, they needed to examine their manuscript fragments closely, to select which tiny spots of pigment to sample, and to draw hypotheses about what they anticipated those pigments might be. And once their spots were sampled, they needed to interpret their spectra, determine whether their hypotheses were correct or incorrect, then account for any unexpected elements that appeared in their samples. That final step entailed a second round of sampling and often many hours in the library, searching the literature for explanations of their surprising results. None of this would have been possible without Dr. Alice Hunt’s expertise and enthusiasm. She not only had the scientific knowledge to operate the pXRF and help the students interpret their spectra, she was also a superior “translator” of scientific concepts for my students. She could explain clearly how the device functioned, how the atoms were reacting to the x-rays, and how to manipulate the spectra to interpret its peaks and valleys — concepts I understood vaguely at best. It was a collaborative teaching experience of the best kind because together we could ensure the students had the book history and scientific grounding they needed to interpret their findings with a reasonable degree of accuracy. Our discoveries were not earth-shaking, but the process of discovery was never dull. In pairs, the students examined five single leaves, all late medieval and all probably produced in northern Europe. The inks were universally iron gall; the blues were all the copper-based azurite, and the reds were primarily the mercury-based vermillion, although the students also discovered one instance of red lead ink and several plant-based reds. However, apart from these expected pigments, the students also unearthed a few puzzles that took some additional analysis, re-sampling, and research. Several groups struggled with the results of their gold leaf samples, which contained much more copper than we anticipated. Another group seemed to have discovered the (chemically impossible) alchemical “mercury blue” — a puzzle we never did solve. The group who analyzed a pink pigment had more success interpreting their results: an excess of calcium and an absence of both lead and mercury indicated that the pink was made by mixing an organic red (not the mercury-based vermilion) and a bone- or shell-based white (not lead white). In every case, the students’ abilities to negotiate this unfamiliar graphical display of data to draw conclusions, and their tenacity in fighting with their results after they navigated the spectra, were truly impressive. MS 1286, Kings Bible leaf. Photo by Cynthia Turner Camp. pXRF in action (with reverse of Kings bible leaf). Photo by Cynthia Turner Camp. So what are the benefits of introducing humanities majors to scientific analysis of manuscripts? From a manuscript study perspective, it makes the process through which these books were constructed come more vividly alive. As one student put it, seeing the trace calcium appear on the parchment’s spectra “is conclusive, in-your-face evidence that a long time ago, an actual human being did indeed take this piece of cow or sheep skin and dunk it in some quicklime to clean it so it could become part of a book. No longer is ‘wash with quicklime’ just an abstract idea in a textbook.” It also invites students to think more granularly about the social and economic backstories of manuscripts. Seeing the elements of copper, gold, mercury, and lead appear on the spectra especially encourages them to think about the channels through which pigments’ raw materials traveled: who manufactured verdigris green from copper and wine, what trading routes brought exotic materials like brazilwood or lapis lazuli to northern Europe, how metals like gold circulated throughout a partially monied society. This elemental analysis helped us step away from thinking about the manuscript as a container of words or an art historical object to instead consider the story of its production and use. Such a shift in perspective opens up a whole new way of thinking about the Middle Ages through the material creation of manuscripts. My final thanks to the University of Georgia Special Collections Libraries, CAIS, and the Center for Teaching and Learning for supporting this distinctive learning opportunity for my students. All photos taken by Cynthia Turner Camp.